Now I have heard virtually the same verbatim sales pitch before from principals and administrators selling a school or district’s shift to constructivism many times before. Every time I hear it I know the speaker was a poor student who wants everyone to reject the importance of what they were lousy at. Honestly though there is tremendous irony in celebrating “no more funnels” in a school district that has been longitudinally tracking all students, including motivation, in order to reliably create a designed mental keel. Instead of a funnel effect that leaves each student free to build up their own understandings of how the world works and a teacher or professor to monitor whether those concepts are brilliant, confused, or just parroting others, the students get their internal mental images, associations, and concepts examined. Precisely in the manner envisioned and hoped for by Piotr Galperin in his Soviet research over decades and sought under that cybernetic theory of control we keep running into. This is from a 1994 book on the STACI Project and its use of Jay Forester’s modelling World Dynamics software modified for the K-12 classroom as STELLA–Structural Thinking Experiential Learning Laboratory with Animation. Just the thing in other words to successfully join in reliable, replicable ways the inner representations of physical image, associated relationships, and conceptual understandings. The book’s title was Classroom Dynamics: Implementing a Technology-Based Learning Environment and it was very much a learning environment of the sort envisioned under obuchenie psychological theories. As far as I know no one is calling this STACI Project How to Get Inside Each Student’s Mental Black Box for Lasting Results, but that’s the intention. Concrete then means those mental representations remain tied to real world events and applications, increasing the likelihood that the inner beliefs will produce the desired future behavior to take transformational action. That internal keel from the last post is also influenced by the constant desire to take the way physical systems operate and apply the concepts to human or social systems or real world phenomena like war, conflict, or the economy. Perception of reality gets predictably influenced by the conceptual ‘lenses’ being supplied by teachers or virtual reality or gaming software, even if a well-informed expert in the area of transfer would immediately recognize the comparison is inapt. Without funneling, few students will. Remember to a social schemer with intentions for radical transformation there is “nothing as valuable as a good theory.” Or simulation of supposed systems to amend the slogan to 21st century intentions. So now we know why the White House sponsored League of Innovative Schools chose Tucson. It was NOT the Titan Missile Museum or the chance to see saguaro cactus. What is so fascinating to me though is that ETS began actively looking for a curriculum innovation to push “higher order thinking skills” back in the mid-80s, soon after Galperin’s research became available in English. The 1994 book was quite graphic that students were being taught to visualize systems so it will change how they view the world. Since I knew that ETS also funded the Gordon Commission on the Future of Assessment in Education from 2011 to 2013, I wondered if the Commission’s work dovetailed with what I am calling this shift to an obuchenie mindset being cultivated in the student. Just how very low this “intellective competence” goal actually is gets hidden by asserting the now acquired ability to “engage and solve quotidian, as well as novel, problems adaptively.” Quotidian sounds most impressive until we look it up in the dictionary and see it translates into everyday problems. Somewhat akin to putting the basketball goal at 5 feet and celebrating everyone’s ability to suddenly dunk. We could call it Basketball for Excellence or Success for All. Gordon did admit though that what is driving him, and one can assume ETS as well since it bankrolled the Commission, is his desire for “developmental democratization” and measures of student achievement not tied to “hegemonic indicators of developed ability.” Those are the intentions behind Gordon and ETS’s beliefs about what should be measured in students. So when you hear the words Growth or Achievement it may reflect computer gaming or group project participation with a change in values and beliefs as the focus. It may mean that the student’s internal representations brought from home and the interactions within a family have now been successfully altered in a student urged to show Grit and Perseverence in novel and ambiguous real world scenarios where there is no right answer and Cognitive Dissonance may be the intention of the scenario. The student may be showing they view all the world including other people as systems that can be gutted and redesigned to see if a better world is possible. As if all things smashed can be reglued after impact. That’s the developmental obuchenie focus that the banner of the Common Core is obscuring. It’s coming in at various rates depending on the venality of consultants and administrators or their naivete. Peter Senge’s version may be more famous, but Spence Rogers’ Teaching for Excellence is another example of the Change the Student focus. That’s why teacher development is so crucial. It’s also the real reason teacher tenure rules are being targeted. Compliance with the developmental vision is required. Only the time schedule and extent of the frenzy to implement varies now. No more funnels. Just internal keels to steer with. With no need for consent. Should we call this all totalitarian education? Computers and ICT generally just keeps getting cited as the magic technology that Marx and Engels speculated could allow a world where everyone’s needs get met. Advances in technology was a hugely important concept in all their political theorizing of how in the future society would be organized in radically different ways. That the age of the individual and capitalism would be over. It’s the era I have explained as small c communism in previous posts because that is what they called it. Well, they also called it the age of association and community. Princeton prof Robert Tucker said it was to be a time of positive humanism. Since that term is less off-putting than either communism or Marxist Humanism, that strikes me as a better term for us to use so we don’t bring in visions of Kremlin Walls or Mao’s Black Book uninvited. But the future social and economic vision is the same as what we have encountered under varying names in numerous posts now. necessarily triggers a social revolution. Computers, the Internet, cellphone communication etc–what I and others abbreviate as ICT–are being held up as that triggering technology. And to put it bluntly we have political idealogues, ready to administer public sector and NGO bureaucrats, and tech and media companies ready to stop future competition, who are quite happy to use education to commence the needed changes in mindsets and values. All while being well-paid of course. All over the globe but especially in the US. That’s really a big part of what Common Core is about when you peel back the layers and delve into the ever present, consistent, feature–must use ICT as an integral part of classroom. The focus. What about under an umbrella on the beach while working on a tan I ask in alarm? No, “kids need to get a deep passion” for what they are doing and school needs to be about what will make them feel passionate. We shouldn’t be rewarding the “kid who stays up late reading a book” while “a kid who spends that same time working with his guild in ‘World of Warcraft’ is thought to have a problem.” Yes, these quotes are coming straight from the program’s transcript. http://www.pbs.org/parents/digital-media/pdf/digital-media-transcript.pdf Have a read if you can stand it. The vision of “where learning and assessment are the same thing.” Which is precisely what Robert Torres said is a big part of the Gates Foundation’s current focus. So that computer, role-playing, games become the means of measuring whether learning is occurring. No I am not kidding. Torres spoke at the G Summit in April 2013 on “Transforming Education with Gamification” and saw it as a means of determining if the Common Core Standards and the new science standards are being met. And I noticed that very time the interviewer, Gabe Zicherman, brought up knowledge, Torres switched back to his preferred term–learning. Behavioral changes then will do while the head remains quite empty. One of the people interviewed as part of that PBS program was Dr Nichole Pinkard, founder of Chicago’s Digital Youth Network. Which Gates is supporting but not quite as generously as the $50 million the MacArthur Foundation has plowed in. Here’s the vision of a different design for classroom learning http://spotlight.macfound.org/blog/entry/pinkard-videogames-inspire-classroom-design/ Dr Pinkard made a very interesting statement in her interview with PBS. She said that “literacy has always been defined by technology.” Under this theory of history grounded in you know who’s writings, the technology changes the type of consciousness. So the printing press and moveable type are what made print the new designated form of literacy. And this line of thinking goes, since we now have tablets and films and videos on demand and computers learning to respond to sound, we should change the nature of what constitutes literacy. Now John Dewey and the Soviet psychologists, among others, all understood that learning to decode and use symbols for sound or math that did not look visually like the concept they actually stood for is what turbocharged the potentials of the individual mind. (As compared with drawing a fish to symbolize a fish). And in the name of Equity and Mastery Learning and Gamification and Engagement and the new Era of ICT, we are trashing that herd-defying, capable of logic, abstract mind. Trying to put the Genie Back in the Bottle and deliberately regress in the average person’s working knowledge. I simply cannot imagine a scenario where this will turn out well. It’s just a matter of how far down this Expensive Road to Ignorance we travel before recognizing what is going on. I believe Marxism in essence is a Public Sector Subjugation Theory over the Individual and his or her Precious Mind. I get why people who currently have power, or who want more like the UN, would want to keep bringing it back. It levels the most capable and turns everyone else into reliable clients in search of “Bread and Circuses” delivered by the public sector and their privileged cronies. And we may not be able to stop this but it is certainly time we understood what infamous theories we are really dealing with here. And thus why digital literacy and the use of the computer in some form is front and center now in education. What Happens When the Hidden Goal of Education Is Interrupting Pre-existing Social Stratifications? What if you were a hungry pioneer in a new town in the middle of nowhere in the 19th century and it was a long, cruel winter? Inexperienced you did not appreciate the danger of eating the seed corn that would be needed if there were to be plants for the following years. So you and your family and maybe other starving townspeople consumed it all to get through the winter. Unaware just how precious it might turn out to be in hindsight. But by then it is gone. That failure to appreciate the precariousness of how we stay where we are culturally and economically, and the preciousness of what it actually took to get to this point in history, is exactly what I worry about when I read statements about “suspending the contributions of inborn capacities” or the “extent to which people expend great effort.” Jettisoning those important things is supposedly necessary to “adequately interrupt the reproduction of pre-existing social stratification.” And I am once again NOT playing Fish Around for Horrific Quotes to Get People Riled Up About the Common Core. Or C-Scope. Or even those preparing for a new type of capitalism 21st Century Skills. Initially the quotes I am using are from another one of those Gordon Commission reports I have been writing about in recent posts. This one called “Democracy, Meritocracy and the Uses of Education” is by Aundra Saa Meroe. It helps frame the very dangerous mindsets being created in graduate higher ed programs to credential adults to impose what are actually political or sociology theories on students in K-12 institutions. And soon to be preschool. I am going to detour for a second to reiterate a point Nobel Economist Friedrich Hayek made in his classic 1944 bestseller The Road to Serfdom. It is something to keep in mind as we explore today and generally in this blog the determination to use educational institutions to transform the prevailing worldviews. In the US and all over the world especially anywhere that ever cherished individual liberty and freedom to create and trade and set rules by private contract. Schools and colleges and universities really are being used to alter individual feelings, values, attitudes, and beliefs to embrace, or at least tolerate or not notice, a radically different political, economic, and social structure than what has ever brought mass prosperity. Hayek with his background in prewar Europe and then among the Fabian social planners in London knew what was, and still is being sought. In this view everything that exists in our 21st Century America is seen as irrevocably tainted by the past and illegitimate. The remedy? 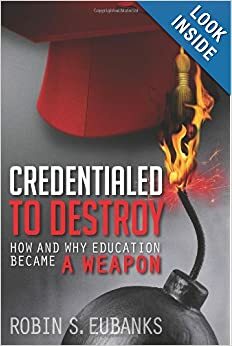 “Absent the larger society’s commitment to an equal distribution of resources, academic institutions are held to be central sites for the distribution of resources.” Hence the Equity in Credentials even if they no longer designate meaningful knowledge or skills. Those unfulfillable expectations merely become more fuel for the desired radical transformation. That’s why all these education reforms are always coupled to a Social Citizenship vision in a Welfare State vision. We first saw it here http://www.invisibleserfscollar.com/morphing-the-common-core-into-a-new-rewritten-us-constitution-by-mandating-false-beliefs/. Meroe then follows up her vision of tainted America with a description of Robert Dahl’s vision for democracy to become “an evolving, progressive social enterprise.” This time “all people must have equal opportunities to realize” their “mutual interests and valued goods.” Of course history has shown that that kind of equality can only exist with an overarching government constantly administering “fairness and justice.” And government involved to that extent will ALWAYS be captured by politically connected rent-seekers wanting favors at our expense. And thus be even less fair or just in the long run. But, hey, let’s not let reality intrude quite yet on all these pie-in-the-sky decrees. Fair enough although with all the behaviorist economists, psychologists, and sociologists involved in the effort you do have to wonder if the “scientific methods” are not BF Skinner’s vision for a science of education using operant conditioning. It sure would fit our known facts and is something to keep an eye on. Meroe is not unique in her angst about the urban areas and seeing the solution as Social Citizenship. We saw it with the Building One America conference and the Regional Equity and Metropolitanism movement I have written about. I read Professor Michael Katz’s The Price of Citizenship: Redefining the American Welfare State this week and got treated to yet more of the Social Citizenship as necessary to give our inner cities a remedy for their devastation argument. Likewise, the involvement of a number of the listed Ed Lab contributors with the Russell Sage Foundation led me to the future vision laid out in 1995 in their Poverty, Inequality and the Future of Social Policy: Western States in the New World Order. So I actually do see where all this is going and it is an unworkable remedy. But I want to go back to the rationales. In particular that the low achievement in the urban districts is a result of “malevolence.” Whose? After all it is the urban districts that readily embraced the Vygotskyian “sociocultural” approaches first. Why? Because as we saw in the goals of the last post and as Leontiev and Bronfenbrenner apparently discussed in the 60s in talking about the Western countries and economies, many decision-makers do not want education theories or practices that preserve or reenforce the prevailing capitalist/individualist systems. They want urban students primed for transformation. This was also why Saul Alinsky’s IAF saw urban schools as great places for community organizing. The Alliance Network in Texas and other states now show it still is viewed that way. I have written about Professor Michael Cole before. In a chapter to a 1985 book called Culture, communication, and cognition: Vygotskyian perspectives, Cole writes “In circumstances where we do not want to take the cultural context as given. . . [sociocultural theory] offers a very fruitful framework because of its militant insistence on linking individual and social activity.” So what was a militant linkage in 1985 is now to be the required classroom practices under the definitions of Effective Teaching under the Common Core. Moreover, that physical and social activity approach had toxic effects in urban areas. Especially when normed or even criterion tests are used against suburban schools which still had an academic focus and parents who could remediate at the proverbial kitchen table or hire a tutor. This went longer than I wanted so I will stop. The dysfunction of the inner cities and the achievement gaps have causes that are not being discussed. They have become excuses for wholesale transformation of all our institutions and even us. From the inside-out. And when we trace backwards we find either false beliefs or political theories with a tragic past. All being pushed by tax free foundations intent on social change and without any willingness to do the cleanup work from the effects of previous theories. Equality-the chimera that threatens to ruin the futures of anyone without political connections.